IT’S JUST TOO DAMN HARD TO JOIN A UNION. That’s the compelling conclusion of new research from the Canadian Labour Institute (CLI). It is also a resounding rebuke to all the bogus “evidence” that unions just don’t matter any more. How much unions matter should be above dispute. After all our Supreme Court has said how important unions are to us all in ruling after ruling. In 2007 the court ruled the right to bargain collectively is “a fundamental aspect of Canadian society” that “reaffirms the values of dignity, personal autonomy, equality and democracy” upheld by the Charter of Rights and Freedoms. Still, workers don’t seem to be getting the message. If they did they’d be joining unions in droves. But they aren’t: the rate of unionization in Canada has been dropping since 1984 (42% then, just above 30% now)? Proof that unions don’t matter to workers say the business and media elites. Not so, says Brodie Noga author of the CLI study. His research shows the main reason union membership is in decline is not that workers don’t want to join—it’s that laws make it too damn hard to join. Specifically: laws that set out how workers are permitted to organize. The research data rules out other factors like changing technology and globalization. Domestic politics, on the other hand, continues to loom large. Since 1982, there have been no fewer than 78 changes to provincial and federal laws that restrict the right to organize unions and bargain collectively. Eight of these have made certification more difficult. Once, all that workers had to do to unionize was to persuade a majority of their workmates to sign union cards (“card check”). Signed cards in hand, a labour relations board could automatically certify them. That would be that. This was true right across the country until 1977. Then, starting with Nova Scotia, mandatory voting began to replace the card check system—which gave employers the time and opportunity to pressure its employees before a vote took place. Seven provincial jurisdictions currently impose mandatory voting. Two (Alberta and Ontario) are set to revert to card check, but grudgingly. In Alberta, 65% of the workers would have to sign cards to avoid a vote, and in Ontario, card check would be applicable only to a few groups of workers. Voting sounds democratic enough, but the conditions under which it takes place is a major factor in outcomes. Even under card check, voting is usually ordered if a certification application is made with fewer than 50% +1 of the workers signed up. In Manitoba, before mandatory voting was imposed by law late last year, the threshold to avoid a vote was 65%. Hence, unions prefer to get cards signed by a convincing majority of employees before applying. Note that unions cannot have on-site meetings during the certification process unless the employer agrees, nor do they have access to the home addresses of employees for contact purposes—unlike the employer. That gives the latter an advantage even under card check, but a mandatory vote adds considerably to that, providing the employer time to intimidate or coerce employees until the vote takes place. There is no doubt that mandatory voting works to the advantage of employers: in BC, for example, successful union certification applications fell by 19% after mandatory voting was introduced in 1984, but bounced right back when card check was reinstated in 1993. Data from Saskatchewan and Ontario bear this out as well. 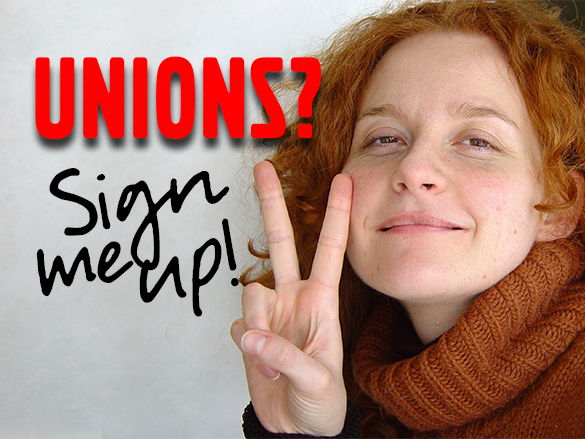 Mandatory voting is not the sole cause of unsuccessful unionization campaigns. Permissive legislation has empowered employers to engage in what were formerly considered unfair labour practices. It also restricts the ability of labour boards to act against employers who interfere with organizing drives. That works hand-in-hand with mandatory voting to create a hostile climate for organizing. In BC and Saskatchewan, employers have been given the right to speak to employees about unionization in the midst of an organizing campaign. In Ontario, the anti-union Mike Harris government took away the powers of the Ontario Labour Relations Board to expedite unfair labour practices complaints, and to issue certification orders in cases of serious employer interference. Certifications dropped. But the rate of unionization climbed again when the OLRB got its powers back in 2005.
toughening up protections against unfair labour practices. The anti-union tide is turning. The Supreme Court has ruled, once and for all, that unions play a positive role in society, and that union rights are constitutionally protected. Our laws should reflect that. Limited positive reforms regarding certification in Ontario and Alberta do point, if cautiously, in a new direction, even if Manitoba has gone the other way. The path forward is clear enough: politically-motivated restrictions on union certification, a key factor in the decline of unionization in Canada, must be lifted. Labour and its political allies have their work cut out for them.